They must be able to thrive outside all year ‘round without any inside shelter. Our climate is relatively benign in Virginia, but our summers are hot and humid and winters see a fair amount of snow and freezing rain. They should be able to raise sets of twins to market weight in six months on grass alone. They should be able to get by with only minimal graining in the later stages of gestation. They must be sheep that would look good grazing in the pastures when city friends came to visit. With these fairly rigorous demands in mind, I began my search for the perfect breed. Combing the Internet, books, and various sheep shows, I narrowed my choice to a number of breeds and looked at Tunis, Welsh Mountain, Icelandic, and Coopworths, before settling on Clun Forests. What was it about the Cluns that won out over the others? Well, several things. The fact that they were purely a production breed with a “no show” rule signaled that these were “working” sheep. The testimonies of other Clun breeders assured me that the breed could do everything I required. And, quite frankly, I liked their looks the most. It was a decision I have never once regretted. The Cluns have met or exceeded all my management goals. I have a low cost, low labor management style on my farm that can be successfully followed by anyone raising Cluns. My sheep are kept on pasture all year round. From April to November they are rotated between small grazing paddocks every week so that they are never on the same patch of grass more than once a month. Once they have completed an entire rotation they are wormed (usually once a month). They have free access to water and a salt and mineral mix at all times. The pastures consist of orchard grass, perennial rye grass, and white clover mixed with native forbs and grasses (i.e., weeds). The sheep are checked daily, but receive no additional food or attention. 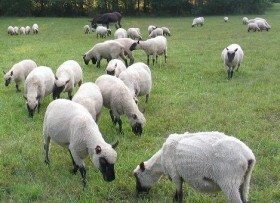 From December through April the sheep remain on pasture, but are fed hay at a rate of roughly 5 lbs per animal. During my first five years of operation, I used the smaller square bales of hay as they were easier to manage given the size of the flock. With more sheep, I now find that the larger round bales are cheaper and less labor intensive. During the final six weeks of gestation the ewes are given some supplemental grain, usually whole corn. 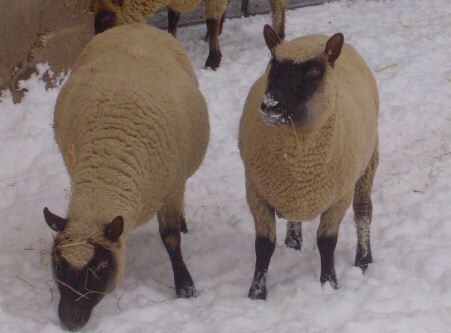 Grain is provided in gradually rising amounts, starting at 2.5 ozs each, until each ewe receives 1 lb of grain a day by the day the ewes are scheduled to begin lambing. The ewes continue to receive 1 lb of grain daily for the first four weeks of lactation, when the amount begins to be cut back by about 2.5 oz each per ewe per week, until they are “weaned” off grain a few weeks before their lambs are weaned off milk. I time our lambing season so that both the ewes and lambs are “weaned” onto a full grass diet in early April, just as our grass growth really takes off. By rigorously following the above management program I have been able to keep our annual feeding and worming costs per ewe (raising twins) at around $35. I do not feel the need to “flush” Clun ewes to prepare them for the breeding season. In fact, in years past I have actually have had to put some of the heaviest grass converters on a diet to ensure that they were in good condition going to into breeding season. I put the ewes to the rams in around September 20th so that I can lamb in late February – early March. Rams are kept with the ewes for 34 days (two cycles) and then removed. As with most other farms, lambing season is the most labor-intensive time of year, but even here I try to keep work at a minimum. At lambing time ewes are kept in a roughly two acre paddock to give them plenty of exercise while at the same time allowing me to keep an eye on them every few hours during the day. I find that feeding grain in the evening ensures that the bulk of the lambs are born in the early a.m. Ewes in labor are watched to ensure that they have no problems in delivery. Every so often a ewe will need assistance, but I only intervene when absolutely necessary. Once the lambs are born, dried off and have nursed, I clip & disinfect the umbilical cord and put the lambs (the ewe follows along) in a 6 x 6 lambing “jug.” Ewes with single lambs are kept in the jug for one day, two days for twins, and three days for triplets. Lambs are ear tagged and tail docked with a band elastrator band on their second day. Triplets are kept with their mothers for the first two days to ensure that all receive a good supply of colostrum. The smallest triplet is then removed for bottle feeding so that all can keep up with the twin lambs. Ewes and lambs are released from the jugs into a separate paddock away from those still waiting to lamb. The heart of this low-cost low-labor management system is rigorous culling. I keep computerized records on all our ewes. Any ewe that consistently has problems in delivery, is late in getting pregnant, or exhibits poor mothering or milk production is culled from the flock. My “three strikes and you’re out” rule means that my ewes are allowed to deliver single lambs only twice. The third time a ewe singles she is removed from the flock. This sounds more drastic in theory than it is in practice. Cluns are incredibly productive, and if this standard is ruthlessly applied, I’ve found that within a couple of years, very few, if any, ewes have to be culled for this reason. In applying this system it took only three years to increase my adult ewe lambing rates from 170% to an average of 190%. I do not cull for old age per se; ewes remain in the breeding flock until they reach their three single lambs limit. 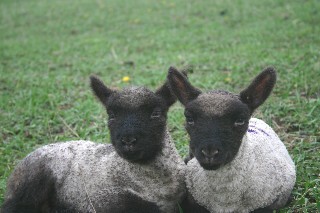 I’ve had ewes give me nice sets of twins in their 12th year. In order to maintain the high productivity of my flock, I have been extremely selective in retaining ewe lambs for breeding. Only twin ewe lambs of good size and appearance are kept. 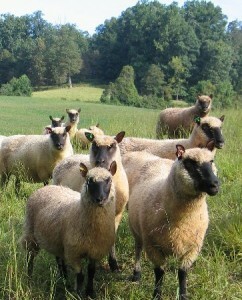 As these ewe lambs are all from highly productive mothers, my selection criteria are mostly concerned with selecting “meaty” and vigorous ewes that most closely approximate the Clun Forest standard. I have found considerable variability in looks in the Clun gene pool in North America, and, all other things being equal, I am partial to ewe lambs with darker faces, upright ears, and wool free legs. Retained ewe lambs are expected to lamb as yearlings or “hoggets” and usually have a single lamb – although a fair number twin, and even occasionally produce triplets, in their first lambings. My “hogget” lambing percentage averages around 120% – 130%. I currently maintain five ewe “families” based on the breeding system developed by Angus Rouse of Nova Scotia (described here). Replacement rams are selected from the best performing ewes, and are even more carefully scrutinized than ewe lambs in terms of body frame, size, and vigor. By following this management system my ewes cost me about $42 each in feed, medication, and shearing. In return they provide me with a sizable profit from their twin lambs sold as freezer lambs or as breeding stock. In 2001, the average return per ewe after those expenses was $250. With Cluns I’ve been able to make money while enjoying a low stress, low cost mode of farming – and the sheep really do look nice out grazing in the pastures when city friends come to visit. I can’t think of a better breed for both beginning farmers and experienced shepherds than Clun Forest sheep.